Photo of the tallest Bougainvillea (pokok bunga kertas) plant in full bloom. The photo was taken from a room at Park Hotel, Miri. The tall Bouganinvillea used a pine tree as a support. The pine tree could be over 100ft tall. From far, the pine tree look like it was infest with a blooming parasite plant. Above: Shot taken from underneath the plant. Bougainvillea (pronounced /ˌbuːɡɨnˈvɪliə/) is a genus of flowering plants native to South America from Brazil west to Peru and south to southern Argentina (Chubut Province). Different authors accept between four and 18 species in the genus. The plant was discovered in Brazil in 1768, by Philibert Commerçon, French Botanist accompanying French Navy admiral and explorer Louis Antoine de Bougainville during his voyage of circumnavigation. They are thorny, woody vines growing anywhere from 1-12 meters tall, scrambling over other plants with their hooked thorns. The thorns are tipped with a black, waxy substance. They are evergreen where rainfall occurs all year, or deciduous if there is a dry season. The leaves are alternate, simple ovate-acuminate, 4-13 cm long and 2-6 cm broad. The actual flower of the plant is small and generally white, but each cluster of three flowers is surrounded by three or six bracts with the bright colors associated with the plant, including pink, magenta, purple, red, orange, white, or yellow. Bougainvillea glabra is sometimes referred to as "paper flower" because the bracts are thin and papery. The fruit is a narrow five-lobed achene. 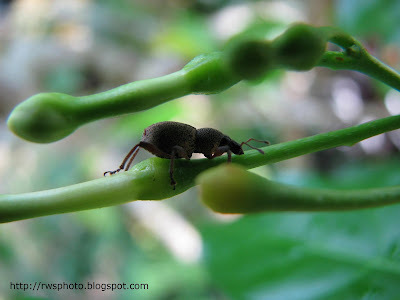 Photo of an unidentified beetle from Borneo crawling on a young flower pod. 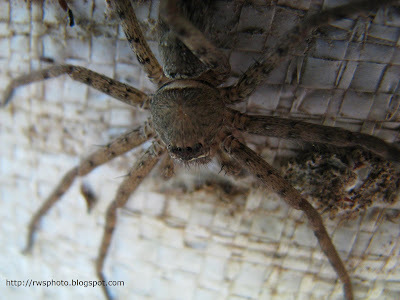 A photo of a tropical common Huntsman Spider underneath a leave mat.